Budget conscious families may be noticing that, lately, they aren’t getting as many glasses out of the apple juice bottle. Well, the truth is, food and beverage packages are shrinking and they’re not taking their price tags with them. A new article on Canada.com reports that the economic downturn, of the past few years, has caused a lot of adjustments and some of those adjustments have been to packaging and how much product your actually getting. Kraft’s Miracle Whip used to be sold in a glass jar containing 950 ml. Today, the plastic container holds 890 ml. Scott toilet paper 1,000 sheet rolls that are now 4.1 inches by 3.7 inches, used to be 4.5 inches by 3.7 inches. Last year a container of Tropicana orange juice was 1.89 litres, today it only holds 1.75 litres. Some companies are trying to distract us with environmental initiatives. 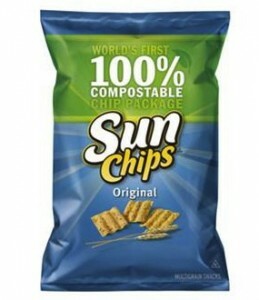 SunChips introduced new packaging earlier this year that is 100% compostable. It says so in big letters on the top of the bag. They failed to mention that the new package now has 15gms less product than the old one. Edgar Dworsky is a consumer protection specialist and editor of the website mouseprint.org, which is dedicated to exposing the tricks and loop-holes in the fine print of advertising. He is also the former Massachusetts assistant attorney general. 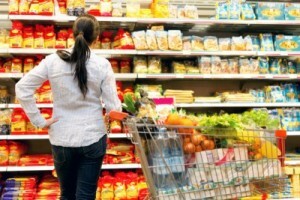 Dworsky advises consumers to keep their eyes open. Not all products in a category will necessarily downsize at the same time, so it is sometimes possible to switch brands and retain or improve value for money. So, like everything else in this economy, grocery shopping is a little harder and we’re getting a little less for our money. Keep your eyes open, watch out for misleading marketing techniques and take advantage of bargains when you find them. – Jen R, Staff Writer. Eco Fabulous: Delora Eco Diapers!